A lawyer for the United Daughters of the Confederacy has asked for a 60-day delay before the city of Winston-Salem asks for a court order to remove a Confederate monument downtown. The Confederate monument in downtown Winston Salem, in front of what was once the Forsyth County Courthouse. 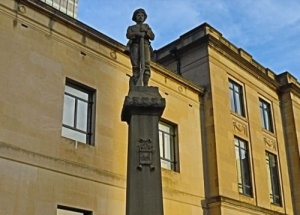 Policy Watch recently covered the controversy over Winston-Salem’s Confederate monument, reporting that Mayor Allen Joines was giving the United Daughters of the Confederacy until the end of this month to remove the statue, which is not publicly owned. But in a January 25 letter to the city, attorney James Davis said the group the UDC chapter he represents thinks there are questions about the statue’s ownership and finds the deadline “arbitrary.” Davis’ letter says Forsyth County, not the city, may be the government that should determine the statue’s future. The Forsyth County Attorney said they are not involved in any discussions over the monument, which currently stands in front of the old Forsyth County courthouse. The owners of the apartment building now there have asked that the statue be removed. Since the UDC has claimed ownership in the past, the city’s position is that the monument is not covered by a 2015 state law that’s prevented the removal of publicly owned Confederate monuments in downtown Raleigh and at UNC-Chapel Hill. Joines has suggested moving the statue to nearby Salem Cemetery, which is home to 36 Confederate graves. No word from the city yet on whether they will consider the delay for which the UDC is asking. Previous PostMedicaid expansion advocates to hold event in Phil Berger’s district todayNext Post Report: Early childhood is worth the investment for N.C.